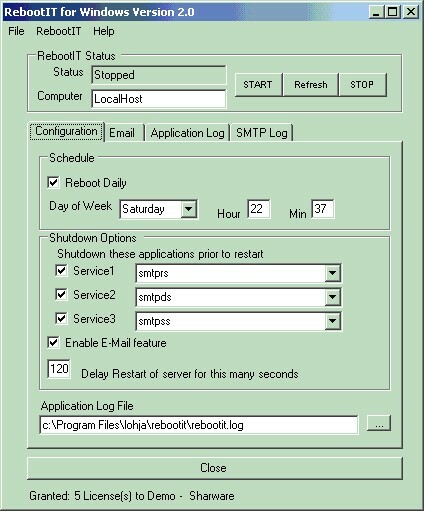 RebootIT 2.0 is system maintenance software developed by Steve Lohja & Associates. 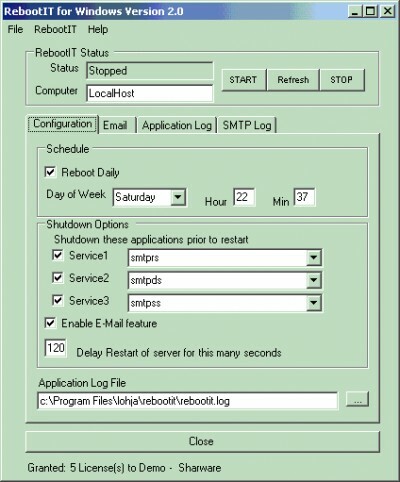 Server-Side application that restarts servers on a configurable schedule. Email notifications are available for server prior to reboot and then after. An email notification is sent out. Allows you to monitor all your servers from your mail box. Enterprise console management tool allows you to connect to each server and configure the schedule which can restart a server On-Demand. Free servers which have the User Interface locked. This is a demo version of the program. In order to use full version features, please go online and order a full version of RebootIT 2.0. The full version is available at regnow and Steve Lohja & Associates website for $50.00. RebootIT 2.0 supports different languages (including English). It works with Windows XP/Vista. We have tested RebootIT 2.0 for spyware and adware modules. The software is absolutely safe to install. Our website has thoroughly tested system utilities product RebootIT 2.0, written the review and uploaded installation file (546K) to our fast server. Downloading RebootIT 2.0 will take several seconds if you use fast ADSL connection. Monitors your network & servers for failures and fixes them automatically.